The MLB season hasn't even REALLY started yet, but another starting pitcher will miss the entire season. 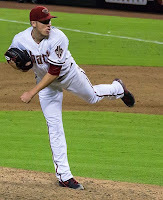 The Arizona Diamondbacks, who are already 0-2 on the season, will be without last years 14 game winner Patrick Corbin. The DBacks rotation currently features Wade Miley, Trevor Cahill, Brandon McCarthy and Bronson Arroyo. Randall Delgado is sure to fill that 5th starter spot, but I would expect Archie Bradley to hit the majors at some point this season.